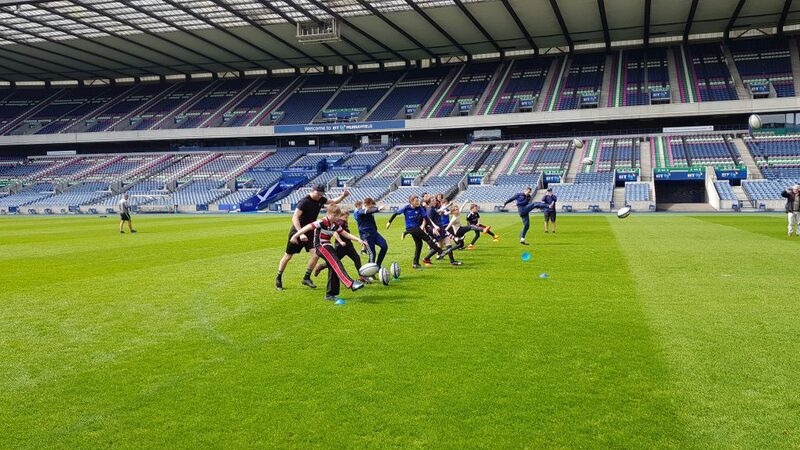 A group of rugby daft kids had an afternoon to remember as they were put through their paces at BT Murrayfield by Scotland international, Finn Russell. The Scotland back held a kicking masterclass for the group of youngsters following a tour of the stadium hosted by Chris Paterson as a charity auction prize from The Eric Liddell Centre’s ‘Going for Gold’ Fundraising Gala in December. The Eric Liddell Centre, a dementia care charity and community hub based in Morningside, hosted the event where Eric Liddell’s daughter, Patricia Liddell Russell, was presented with her father’s reissued Scotland international rugby cap by the SRU. “The children had an absolutely fantastic time at BT Murrayfield from the moment we arrived till the moment we left and were still buzzing with excitement hours afterwards, as were most of the Parents. I would like to say a massive thank you to everyone at the SRU who made this possible. “I’d like to specifically mention Graham Law who organized and set everything up for us on the day at the stadium, to Chris Paterson who was a most fantastic host and guide for the whole event; and of course to Finn Russell for also taking the time out of his weekend to show the kids how to kick a rugby ball.